The American 82nd and 101st Airborne Divisions, Britain's Red Devils and Germany's Fallschirmjägers: all inside this World War II Airborne Battles special issue. Everything looks different when you’re jumping out of a plane 700 feet above the ground at 110 miles per hour. …That includes the largest sea invasion in human history. Nicknamed “skysoldiers,” the Airborne Infantry Divisions were the elite fighters of World War II. Deployed at a moment’s notice and dropped far behind enemy lines, paratroopers played a pivotal role in the war’s most important conflicts, from Arnhem Bridge to the Battle of the Bulge. This Warfare History Network special issue features over 149 pages of airborne action, from the exploits of America’s 101st and 82nd airborne divisions to Britain’s Red Devils and Germany’s Fallschirmjägers. You’ll get to see the fighting up close as these airborne units dropped into Eben-Emael, Normandy, and in southern France during Operation Dragoon. You’ll of course gain insight into each riveting battle, every audacious invasion carried out by the Allied airborne divisions. (You’ll even come across the exploits of a few German paratroopers.) But you’ll get to hear about them not only from our own personal staff of experts, but also from the skysoldiers themselves. Lud Labutka tried desperately to calm his nerves as he and his unit were approaching Normandy. It was the launch of the D-Day invasion, and like 13,100 other paratroopers in the 82nd and 101st Airborne Divisions in the air alongside him, he had quite a bit on his mind. So he thought maybe a drink would help settle his stomach. Jumping from an airplane during the great Allied assault of France never crossed Labutka’s mind in 1939, when he joined the Pennsylvania National Guard. But much would change in the next three years. Labutka was eventually assigned to the 502nd Parachute Infantry Regiment, which left for Europe on September 5, 1943. But at that time, the division had no battle history. To the other GIs, these so-called “Screaming Eagles” were just a bunch of cocky, overpaid servicemen. 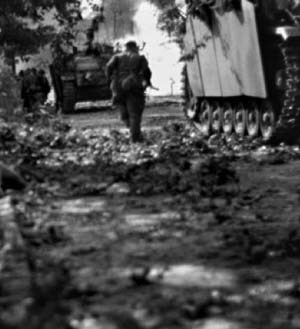 All of that would change when Labutka and his fellow soldiers jumped from their C-47 transports into Normandy’s pre-dawn darkness, fulfilling what General Wiliam Lee called their rendezvous with destiny. Inside this special issue, you’ll learn exactly what happened to Labutka as he made his D-Day jump, what he saw in the town of St. Marie du Mont and how he ended up in the fighting at Carentan. But we don’t just stop at the American Airborne Divisions at D-Day. Our special issue covers every major airborne assault from the perspectives that matter most. At Warfare History Network, we’re well aware of the other brave skysoldiers of World War II and the legacy they created. It was 8 o’clock at night on the evening of September 17, 1944. After a long march from its drop zone, the men of the 2nd Battalion from Britain’s elite Parachute Regiment had reached the main objective of Operation Market-Garden: Arnhem Bridge. The quiet and subdued setting wouldn’t last long. 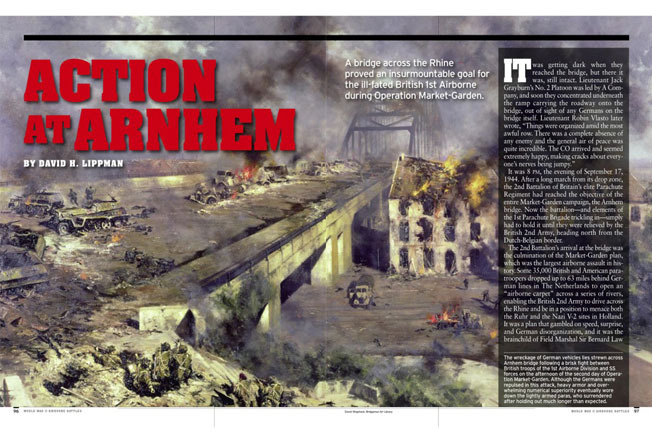 As you’ll soon read, the Battle of Arnhem Bridge, one of the most famous and desperate battles of World War II, was about to begin. At the time, Market Garden was the largest airborne assault mission in history. Some 35,000 British and American paratroopers dropped up to 63 miles behind German lines in the Netherlands. Their mission was to open an “airborne carpet” across a series of rivers to be used by the British. The brainchild of Field Marshal Sir Bernard Law Montgomery, if the Market-Garden plan proved successful, it could shorten the war to mere months, or weeks. Unfortunately, it did anything but. At the start, the Germans failed to adequately garrison Arnhem Bridge because they were more concerned with the bridge at Nijmegen. Both sides were waiting for the dawn, but the Germans had an ace up their sleeve. Unknown to or ignored by British intelligence, the 2nd SS Panzer Corps were in the woods near Arnhem Bridge, recuperating from the Normandy assault. Despite being understrength, the corps, under Lt. Gen. Willi Bittrich, would prove to be a formidable force in the battles ahead. So how did the British perform, under the circumstances? As you’ll find out inside, their efforts throughout the nine-day assault were legendary. Their outnumbered and outgunned forces held on against overwhelming odds. Surprisingly, the 2nd Parachute Battalion never actually surrendered. You’ll learn exactly what happened by picking up your copy of our Airborne special issue today. Those are just two of the many special features and in-depth stories you’ll find between the pages of this special issue. Sainte Mere-Eglise, the German parachute victory in Crete, Scandinavian airborne assaults, glider missions at Pegasus Bridge: over 140 pages of airborne action. And best of all, it’s immediately available. From the daring drops at Normandy to the training required for each mission, your chance to see the Screaming Eagles, the Red Devils and the Fallschirmjägers up close is just one click away. So order your copy now! P.S. It’s amazing Labutka survived the war, and he must have had luck on his side: twice he was almost done in by his own troops. Find out how inside!